Be the first to share your favorite memory, photo or story of Johnson. This memorial page is dedicated for family, friends and future generations to celebrate the life of their loved one. 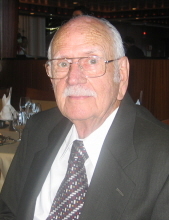 Johnson Clyde Corley, age 95, of Winston, Georgia passed away Sunday, April 7, 2019. He was born on December 6, 1923 in Polk County, Georgia son of the late Virgil Cain Corley and the late Mattie Mae Johnson Corley. He served in the United States Navy during World War II. He retired from Three Way Campers where he worked as parts manager. He served as a Deacon at Rose Lane Baptist Church in Marietta and was currently a member of Ephesus Baptist Church in Villa Rica, Georgia. Mr. Corley was an avid gardener. In addition to his parents, his wife, Bonnie Kate Sparks Corley and his son, William Zacharia Owens also preceded him in death. He is survived by his sons and daughters-in-law: Ronald Clyde and Sue Corley, Donald Wayne and Joanna Corley, and Tony Lamar and Dianne Owens; daughter: Geneva Pruitt; sisters: Margaret Virginia Shaw and Mattie Ruth Cook; brothers and sisters-in-law: William Thomas and Mareta Corley, Royce Delano and Fay Corley; grandchildren: Rhonda Jagus, Karen Stewart, Johnson Scott Corley, Kimberly Carrie Corley, Michelle Turner-Neunsinger, Lee Ann Turner-White, Tony Lamar Owens, Jr., Regina Kay Owens, Glenda Marie Owens, Randy Lee Owens, and Sherry Lynn Owens; 6 Great Grandchildren; 1 Great-Great Grandchild. The family will receive friends at Hightower’s Memorial Chapel, 12651 Veterans Memorial Highway, Douglasville, Georgia 30134 on Friday, April 12, 2019 from 6:00-8:00 P.M. The funeral service will be held Saturday, April 13, 2019 at 11:00 A.M. at Ephesus Baptist Church in Villa Rica, Georgia with Dr. Billy Godwin officiating. The casket will be placed in the church at 10:00 A.M.
Interment will follow in Mountain View Park Cemetery in Marietta, Georgia at 1:30 P.M. In lieu of flowers, the family requests contributions be made to the Freedom For The Future (Building Fund) c/o Ephesus Baptist Church, mail: EBC Financial Secretary, P.O. Box 280, Winston, GA 30187, Call: 770-942-4327, or Give Online: https://onrealm.org/ebclife/Give (select Freedom for the Future). Hightower’s Memorial Chapel of Douglasville, Georgia has charge of the arrangements 770-489-2818. To send flowers or a remembrance gift to the family of Johnson Clyde Corley, please visit our Tribute Store. "Email Address" would like to share the life celebration of Johnson Clyde Corley. Click on the "link" to go to share a favorite memory or leave a condolence message for the family.